The following post is part of our Law Student Blog Writing Project, and is authored by J. Alexander Haney, a Juris Doctor student at NKU Chase College of Law, Northern Kentucky University. To say that the practice of law has changed with time would be a gross understatement. From its roots in English common law, to the master and apprentice model which helped shape the legal careers of Abraham Lincoln and Oliver Wendell Holmes, Jr., to the modern courtroom of technology and science, the legal profession has undergone numerous transformations. Of course, such is the nature of all fields of practice, and each field has its impact felt in varying ways by all those contemporaneous around it. Law is no different. With each medical advance, the law must adapt. With each improvement to machinery, the law must find a way to accommodate the changes. With each scientific progress, the law must discover how to best use new methods of testing to more accurately and completely bring forth the evidence in a case. There is no sign readily visible to suggest that the field of science will slow anytime soon. The opposite is likely true. Ray Kurzweil, one of the world’s leading inventors, thinkers, and futurists, wrote about the “Law of Accelerating Returns,” stating that “[W]e won’t experience 100 years of progress in the 21st century—it will be more like 20,000 years of progress (at today’s rate).” That is to say, advancements in science are not slowing down, but rather resemble an exponential curve. Iron sharpens iron, and advancements beget greater advancements. From the first flight with a wood and cloth oversized kite in 1903, to the climax of the Space Race when Man first walked across the lunar surface in 1969, was a mere sixty-six years. In 1998, the International Space Station launched, and is still in use, today. The point is that science advances by the second, and practioners of the law can ill afford to fail to keep up. Recently, Lawrence & Associates, LLC, was faced with a case in which scientific evidence allowed us to go above and beyond what would otherwise have been a run-of-the-mill slip-and-fall case. On a particular January evening, a light layer of snow covered the ground of the parking lot outside of the grocery store. Our client, upon walking out of the store, slipped on a patch of ice, and fractured her ankle. The basics of the case are relatively simple, and do not distinguish themselves from the typical slip-and-fall. There was ice, a woman fell, and was injured. However, the lead attorney on the case, Peter A. Tripp, Esq., used the discovery period to take the case beyond what it likely would have been, otherwise. In its case, Defendant used the legal doctrine of “open and obvious” as a mitigating factor, claiming that the ice patch was clearly visible. Defense also asserted the theory that it would be unreasonable to expect perfection in clearing the parking lot of ice, and that reasonable measures had been taken to create a safe area for customers. The open-and-obvious doctrine simply means that a defendant’s negligence may be mitigated if the plaintiff should have reasonably been able to notice and avoid a clear hazard. Consider a sinkhole that takes up an entire parking lot, for example. One would expect to see the hazard to be blocked off, but even if it were not, a potential plaintiff could reasonably be expected to see the massive hazard, and be able to avoid it. An ice patch covered by snow is not of the grandeur of a sink hole, but it would be reasonable to expect slippery conditions in freezing temperatures and snowy weather. In order to clear the hurdle of showing that the defendant had breached its duty to Plaintiff, it was necessary to find more evidence. Naturally, not every instance in which science has been used to make a case has turned out in favor of the party implementing some new method. Perhaps most notably, there have been numerous accounts that the DNA evidence presented in the course of the OJ Simpson trial was either too complex, or that the use of DNA evidence was just too foreign a concept at the time. The accuracy of these claims can be disputed, but the point is made, all the same. The opposite seems to be true more often than not, though. People are typically visual learners, so much so that research suggests that sight makes up 80-85% of our perception of the world around us. Juries are made up of people, which is an important fact to remember when attempting to prove one’s perspective of a case. In today’s time, the average person is not only better versed in the understanding of scientific advancements, and more trusting of them, but is also nearly completely reliant on them. As of 2014, 91% of adults in the United States owned a cell phone. Most of these require some form of connection to the internet, placing the greatest amalgamation of information ever consolidated literally in the palm of one’s hand. Using science in the course of proving a case is not so much an exercise in convincing a jury that the science is valid, but more of a contest to see which side provides the most convincing science. In its most general definition, the prevalence of science in the courtroom may be attributed to what is colloquially known as the “CSI Effect,” though the extent to which the phenomenon has impacted the practice of law is debatable. What is not debatable is that scientific evidence plays a major role in how a jury decides a case, and that cannot be overlooked by any attorney hoping to continue to be effective. In the aforementioned case, Defendant, a company hired to spread salt and remove snow and ice from the parking lot, had done its job insofar as it had spread salt around the parking lot. To show whether or not such action was enough to meet the level of duty it was held to, Plaintiff investigated into the proper actions, and proper use of salt which would be necessary. In short, a lot of science was used. Salt works to melt ice by lowering the temperature at which water will freeze. It is the same principle which allows fresh water to freeze into glaciers, whereas salt water does not. It was discovered in the case that Defendant spread 23,000 pounds of rock salt throughout the parking lot, and twelve (12) bags of calcium chloride on the sidewalks of the property. The rock salt used is not uncommon in such business, and is identical to what one might find at a local hardware store. The two products work differently to achieve the same ends, but their individual effectiveness varies depending on many factors, most notably, temperature. The eutectic temperature is the point at which the freezing temperature of a solution can no longer me lowered. Normal rock salt is typically not used when pavement reaches temperatures below ten degrees Fahrenheit, as the eutectic temperature for a rock salt and water mixture is five degrees Fahrenheit. To find these facts, and to study the example of a state well-versed in deicing, research was done into the practices of the Michigan Department of Transportation. According to archives, Michigan sees some of the coldest weather in the country during the winter months, with an average monthly snowfall during those months of just under three inches. In place of the typical sodium chloride salt, magnesium chloride is often used in colder temperatures, as its eutectic temperature is around negative twenty-eight degrees Fahrenheit at a mixture of 21.6 percent magnesium chloride to 78.4 percent water. Magnesium chloride, it was found, is not only effective at lower temperatures than is sodium chloride, but the concentration of the solution does not need to be as high to be effective, either. Numerous studies were researched to find the information used in the case, including multiple studies comparing the effectiveness of sodium chloride and magnesium chloride in deicing. For the purposes of this article, other parts of the case are irrelevant. The important aspect is how science was used to allow the evidence presented to tell the entire story. 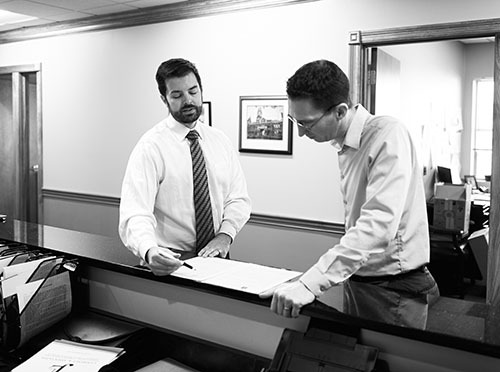 At the beginning of the case, Plaintiff faced the challenge of proving negligence on the part of Defendant. Had Defendant simply not spread any deicing solution, the case would be open and shut, with an “open-and-obvious” breach of duty. That was not the case, though. Instead, attorneys needed more information. That information was found by investigating scientific studies conducted on the subject matter. Through science, it could be shown that simply spreading salt was not sufficient, given the circumstances. Rather, a different solution was needed, and that solution was and is one that is regularly used. The information used to litigate the exemplar case allowed Plaintiff to go beyond the face value of the facts, and bring forth the totality of the story created by the evidence. It allowed for a better argument, a more in depth investigation, and, most importantly, a victory. Plaintiff and Defendant, though named as acting parties in the discussion of a case, work through the attorneys who represent them. According to the Model Rules of Professional Conduct, it is the responsibility of a lawyer, as advocate and representative, to “zealously assert the client’s position under the rules of the adversary system.” To meet this requirement, it is necessary for the practicing attorney to remain up to date, and to able to understand how to effectively use the field of science to their benefit, and to the benefit of their client. The importance of science in the modern legal field cannot be overstated, nor can be the obligation of every attorney to keep up. Science is a friend to the attorney, and that ally becomes more important by the day. Carl Sagan said, “Extraordinary claims require extraordinary evidence.” Science give us the tools to prove the extraordinary. Transportation Research Board. 1974. NCHRP Synthesis of Highway Practice 24: Minimizing Deicing Chemical Use. National Research Council, Washington, D.C.
Fay, L. and Shi, X. (2011). “Laboratory Investigation of Performance and Impacts of Snow and Ice Control Chemicals for Winter Road Service.” J. Cold Reg. Eng., 10.1061/(ASCE)CR.1943-5495.0000025, 89-114.